I got yer bitter right here, pal. Anybody who knows Wesly and me know that we love bitters and amaro. “What is amaro?” some of you may ask. (Oh hi, you must be new!) The word “amaro” means “bitter” in Italian, with its Romance language counterparts “amer” in French and “amargo” in Spanish. Synonymous with “digestif” and “digestivo,” an amaro is a bitter liqueur, usually with some sweetness, comprised of herbs, roots, barks and spices, that is primarily meant to be taken after dinner to help settle one’s digestion. Most amari (plural of amaro) are quite effective at this; they’re a perfect example of herbal medicine at work. Italy is a wonderland of amari, with myriad examples made throughout the country, most of which are incredibly local and bound by their ingredients to the regions from which they originate. If liqueurs of any kind could be said to have a terroir, that would describe amari — they tend to feature local very local plants and herbs among their ingredients. The amari we have available to us in the U.S. is but a mere fraction of what’s available in Italy, as most of them aren’t exported. (When we finally go to Italy I’m going to need two suitcases just for booze.) But I digress. Our addiction to bitters runs the gamut, starting with “dashing bitters,” aromatic or single-flavor bitters that are generally used by the dash rather than by the ounce. The bar at home used to have a dedicated “bitters shelf,” the short shelf on the top. It still does, but our collection of aromatic bitters has far outgrown that space. Now we have aromatic bitters on top of the bar, including a whole pretty row of our locally-made varieties, Miracle Mile Bitters and Olive Heights Bitters. We used to have a piano in the living room that we hardly touched; that went to Wesly’s sister’s house for our nieces to not touch, and was replaced by a bookcase. The bottom shelf is entirely devoted to our drinking bitters — amari, digestivi and aperitivi. At last count we had 48 different kinds of amaro, including bitter apéritifs/aperitivi. Oh wait, make that 49. It’s a doozy, too. From our good friends at Haus Alpenz comes Elisir Novasalus, a wine-based amaro that is one of the most bracingly, unrelentingly bitter amari I have ever tasted. L’Elisir Novasalus (“The new health elixir”) comes from Distilleria Cappelletti in Trentino in the north of Italy — they make a wide range of grappa, liqueurs, aperitivi — including the fascinating and delicious wine-based Campari alternative Aperitivo Cappelletti — and amari; this appears to be their flagship amaro. 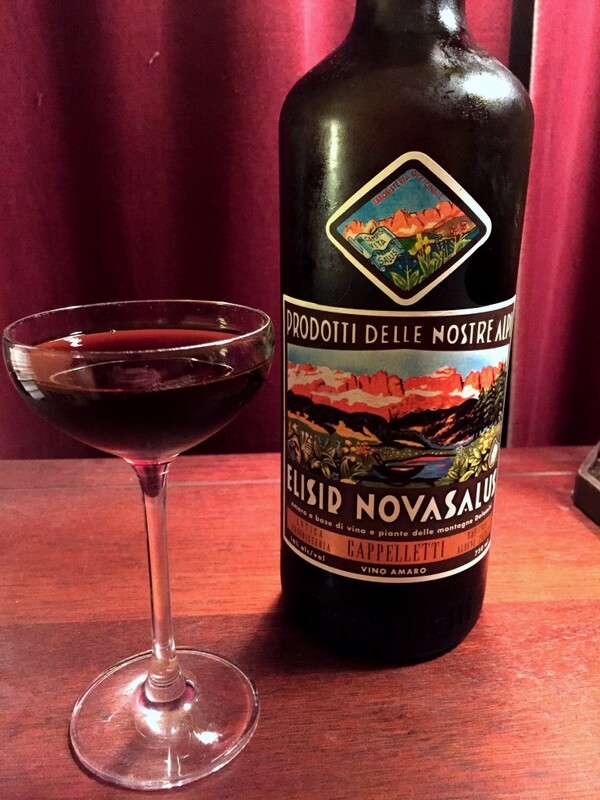 Unlike most it has a wine base, in this case dry Marsala wine, infused under the direction of an “erborista” (herbalist) with over 30 plants, flowers, roots and herbs from the surrounding region and in particular the high Alpine region of Alto Adige just north of Trentino; or, as the label says in Italian, “amaro based on wine and plants from the Dolomite mountains.” Burdock, dandelion, aloe, gentian, alder buckthorn and cinchona are in the mix, as is some kind of tree sap brought in from Sicily (although which one is unclear). The Marsala gives it a solid flavor base (and of course also means you’ll need to keep this one in the fridge), and the first sip is … like getting kicked in the crotch by a tree. I know, that sounds bad, but it’s actually … not. Don’t get me wrong, it’s bitter — very, very bitter. You’ll make a face. But then your face will soften, and you’ll find yourself compelled to sip it again, and again. 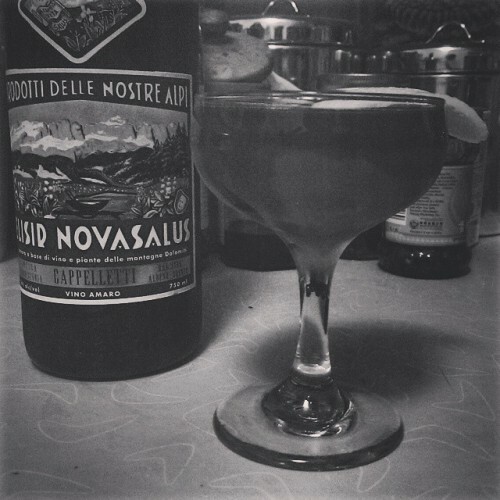 After the initial shock of the first couple of sips Novasalus’ marvelous complexity becomes apparent. It’s a very dry liqueur but then a touch sweetness comes in. My first thought was “earthy,” and you want to keep sipping try to figure out what all those myriad layers of flavors are. “It grows on you” is a cliché but in this case it really does, and it’s fascinating, and while you want to make sure that whatever’s growing on you isn’t something out of a horror movie, you find that this liqueur, this elixir, this amazing new medicine, isn’t going to last long enough to go bad in your fridge. 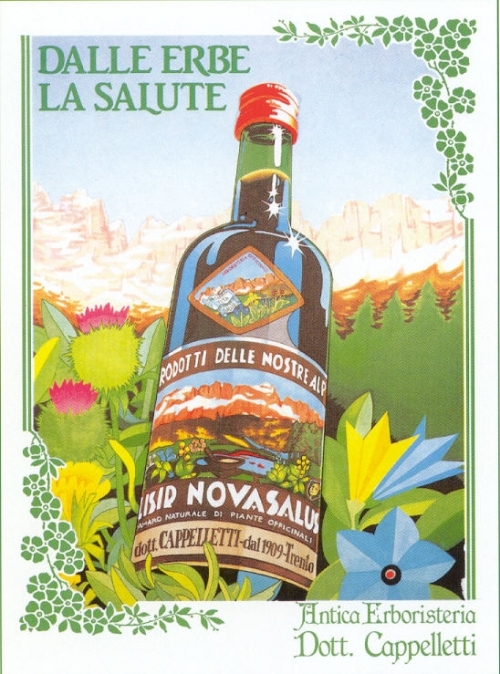 My favorite description of its medicinal effects were from an Italian website, put through Google Translate: “Elixir Novasalus helps all organs to work in the best way to obtain an improvement in the regularity of the organism. It can be used as needed or for long periods.” All righty, then. Many folks also say it really does help settle your stomach after dinner, and I can testify to this as well. Stir with cracked ice and strain into chilled cocktail coupe; twist an orange peel over the drink and garnish with the peel. Never has “we don’t hate it” been such a ringing endorsement, but it is. As we’ve sipped more and more of it, not only do we not hate it … we kinda love it. Make no mistake, this is a challenging amaro. But if you love amari as we do, and if you love to explore the flavors of Italy via spirits, you really can’t miss this one. It’s inexpensive, in the $23-25 range, well worth it for the bold amaro lover! I didn’t entitle this post with a “Negroni Variations,” because technically it isn’t, although it has two of the same ingredients and follows the same general formula. Stir and strain. Garnish with orange slice, lemon twist or cherry at your discretion. Ask for it by name! 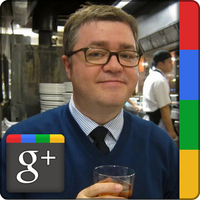 Finally, here’s a variation on that which came about one night when bartender Chris Day and I were talking about cocktails in Google Chat. Our Boulevardier and Funky Negroni got together and had a demon spawn, which is actually amazingly good. George T. Stagg Bourbon is arguably the best Bourbon on the planet. It’s certainly my special favorite, so full of flavor that it makes your head spin … quite literally. This is because Stagg is also barrel proof, slightly varying in proof each year but is generally around 144 proof. That’s 72% alcohol, kids — not to be trifled with. It’s a bit hot to drink neat — you might want to add a bit of cool water — but it mixes amazingly well. Given its strength proportions almost always have to be adjusted, but this gets easier with practice. Combine the first 3 ingredients with ice, stir and strain into a chilled coupe. Float Smith and Cross onto the surface of the drink. Lemon peel garnish. Make sure someone else is driving you if you have this one. And with that, our little series on Negroni variations comes to an end. 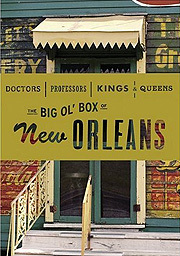 This should give you plenty of stuff to try at home or in your favorite bar, as they should be pretty easy to order (i.e., “Genever Negroni,” “Stagg Boulevardier with a Smith & Cross float,” etc.). So, give ‘em a try! [B]ack when it was young, rum was possessed of a certain “hogo.” Derived from the French phrase for the “high taste” (haut goût) game meats develop when they’re hung up to mature before cooking — and by “mature,” we mean “rot” — hogo used to be a term of art in the rum trade to describe the sulfurous, funky tang that raw-sugarcane spirits throw off. For 300 years, rum distillers have sought ways first to tame and then to eliminate it: high-proof distillation (more alcohol equals less hogo), filtering, tweaking the fermentation, long aging in barrels — all very effective, particularly when used in combination. Perhaps too effective. Stir & strain, no garnish. 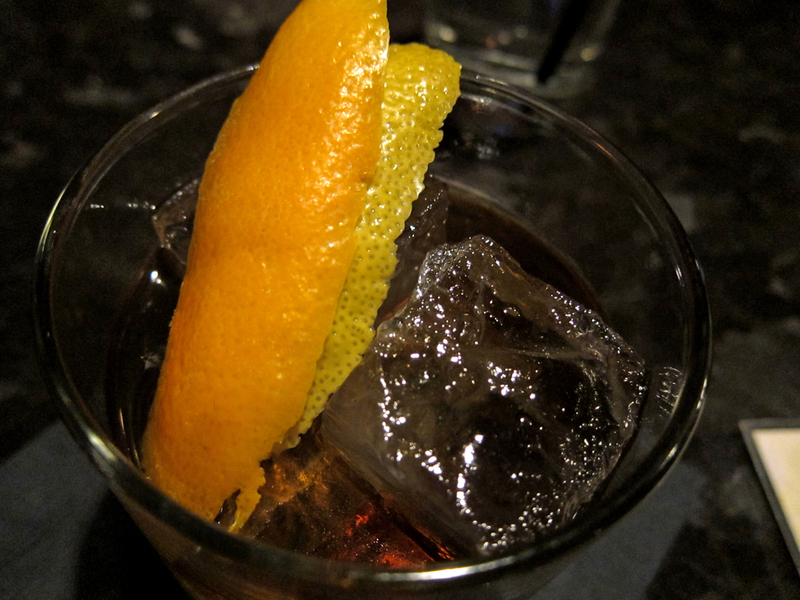 Joaquin takes the vermouth back to cut down on the sweetness, but feel free to kick it back up to 1 ounce if you like. The way I first heard about this was without a garnish, but sometimes I enjoy an orange twist with it. This drink came into my house, mated with another one and begat a Devil’s Spawn … a most diabolical, wonderful one. Stay tuned! I do love me a Negroni. My first introduction to Campari was in the entertaining Combustible Edison cocktail, in which an ounce each of Campari and lemon juice are shaken and strained into a cocktail glass, and then two ounces of warmed Cognac are flamed and poured in a flaming stream into the glass. Entertaining indeed, but not my favorite. Many folks’ introduction to Campari is by mixing it with orange juice, about double juice to spirit, perhaps with a splash of soda or tonic. I’d have to pick the Negroni as my favorite, though, and if you haven’t tried it you should. As with most adult tastes, it’s one worth acquiring. The drink we know as the Negroni has had various names; the Camparinette is perhaps the most well-known, and according to Andrew the Alchemist it was also called the Cardinale in Italy. It dates back to as early as 1919, although what the Italians were calling a “Negroni” then would seem more like an Americano with gin to us. All this has evolved into the classic Negroni proportion we’ve come to know — equal parts gin, sweet vermouth and Campari. That can be a bit sweet for some people, and I’ve seen many variations on the proportion — typical is 1-1/2 gin, 1 Campari and 3/4 vermouth, to keep the sweetness at bay. 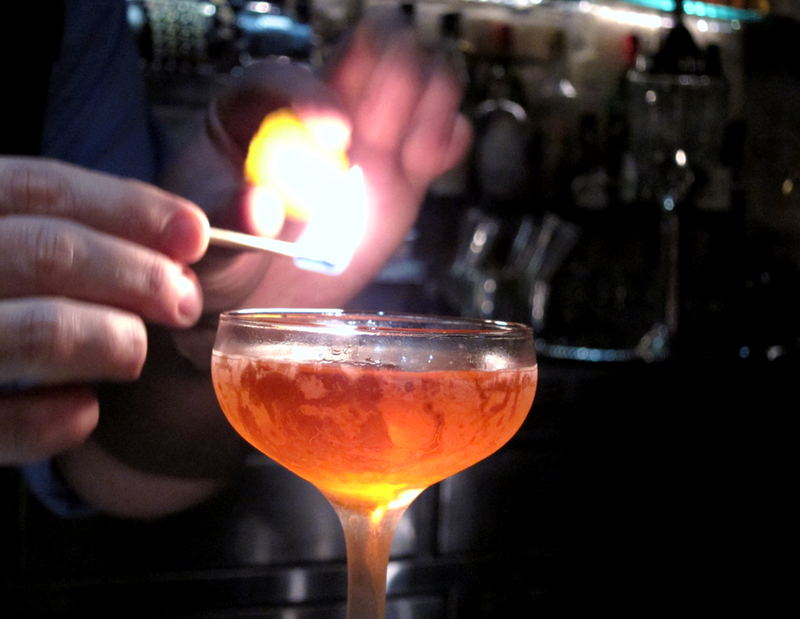 I’ve also been fond of the Cinnabar Negroni, in which the Campari is doubled and orange bitters added. The basic Negroni formula lends itself quite nicely to variation of spirits and even in the bitter element, despite Campari seeming quintessential to the drink. I’ve sampled many lovely versions that take the gin-Campari-vermouth formula to something more like spirit-bitter-aromatized wine. Aperol is a natural substitute for the Campari, but other interesting bitters outside the dark Italian amaro field have popped up recently. One of my favorites is the Swiss-made bitter called Gran Classico Bitter, based on a recipe from Turin from the 1860s. It contains bitter orange, gentian, rhubarb and wormwood among its botanicals. It’s got quite a bitter punch, not unlike Campari but with a less bright, rounder, deeper flavor. It’s being directly marketed as a Campari substitute, even recommending its use in cocktails like the Negroni, Americano or spritzer. Jason Schiffer at 320 Main in Seal Beach, CA uses Gran Classico in one of my favorite recent twists on the Negroni, swapping the gin for its malty progenitor, Dutch genever, and bringing down the other two components. The maltiness of genever with the citrus oils accenting the citrus notes in the bitter work beautifully here; this one didn’t last long the last time we visited 320. They’ve just changed their menu and this cocktail isn’t on it anymore, but they’d still be happy to make you one. If you’re in Southern California, and especially if you’re in Orange County, you need to drink here — it’s the best place to get a drink for many miles. The food’s terrific, too. Duck mac ‘n cheese? Oh my. 3/4 ounce Carpano Antica sweet vermouth. 3/4 ounce Gran Classico bitter. Lemon and orange peel & oils. Combine with ice and stir for at least 30 seconds. Strain into an Old Fashioned glass. Express the oil from the lemon and orange peels onto the surface of the drink, and garnish with the peels.